Minsk (AFP) - Fighting raged Friday as Ukraine prepared to sign a Kremlin-backed truce with insurgents that could halt five months of bloodshed but whose failure would unleash new Western sanctions against Russia. The tense hours preceding the peace talks that opened in the Belarussian capital Minsk saw the rebels advance to the very edge of the industrial port of Mariupol -- the latest strategic flashpoint in a conflict that has plunged East-West ties to a post-Cold War low. 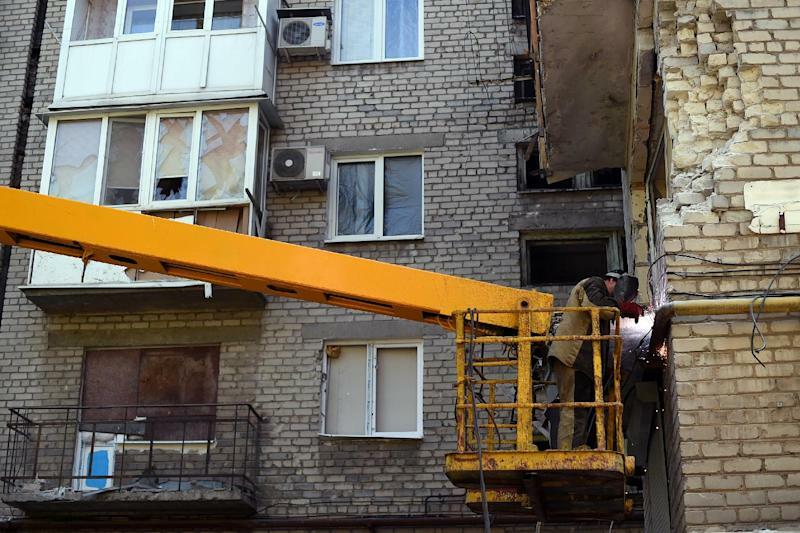 AFP correspondents also reported overnight shelling that killed five civilians in the main rebel bastion of Donetsk, a city that government forces had all but encircled until being beaten back by separatists last week. The seven-point ceasefire plan -- unveiled Tuesday by Russian President Vladimir Putin after telephone talks with Ukrainian counterpart Petro Poroshenko -- calls on both sides to halt "offensive operations" and for government troops to retreat from much of the eastern industrial regions of Donetsk and Lugansk. Poroshenko said he held out "very careful optimism" that peace could return to the splintered ex-Soviet country once the pact is signed at the European-brokered talks. "The only thing we need now for peace and stability is just two main things," Poroshenko said Thursday on the sidelines of the NATO summit in Wales. "First, that Russia withdraw its troops; and second, to close the border." NATO leaders reaffirmed their unanimous backing for Ukraine at their two-day meeting that has focused largely on Russia's new expansionist threat. EU and US officials have said sanctions against Russia would be announced Friday in response to a major escalation of Moscow's military support to the rebels that has raised fears of another land grab after the annexation of Crimea in March. But British Foreign Secretary Philip Hammond said the measures could be lifted in the event of a sustained truce. "If there is a ceasefire, if it is signed and if it is then implemented, we can then look at lifting sanctions off," he said at the NATO meeting. Any ceasefire would nonetheless leave the political status of Ukraine's economically-vital east uncertain and expose Poroshenko to charges that he had signed his government's surrender to Russian troops. Poroshenko had vowed after his May election to crush the rebellion -- a mission on the brink of success until NATO last week reported that more than 1,000 Russian soldiers had flooded across the border with heavy weapons in support of a sweeping rebel counter-offensive. The Kremlin accuses the Western military alliance of concocting the evidence in order to expand its own presence along Russia's western frontier. But Western allies suspect Putin of trying to throw Kiev's leaders -- in power since the February ouster of a Moscow-backed administration -- off balance and keep the east's huge industrial base dependent on Russian trade. 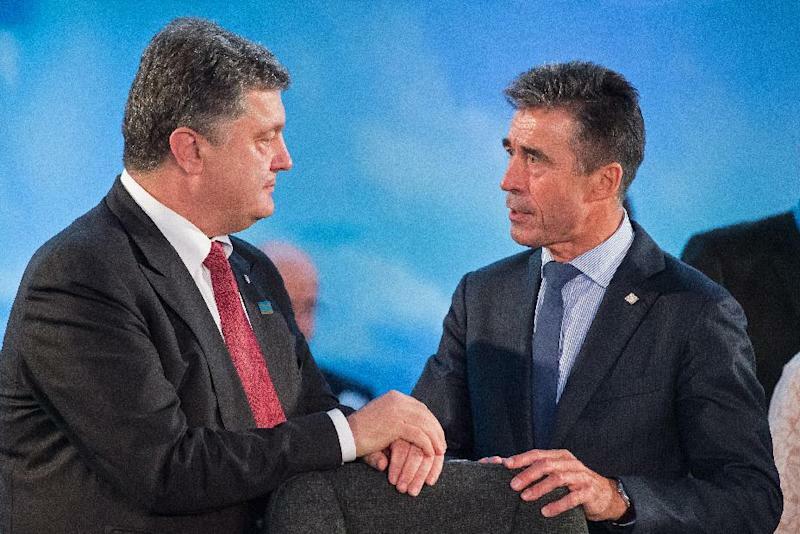 "While talking about peace, Russia has not made one single step to make peace possible," NATO chief Anders Fogh Rasmussen observed. EU leaders are considering new reprisals that would keep Russia's biggest energy and defence corporations from raising money in the West. They are also holding early discussions about boycotting the 2018 football World Cup in Russia -- an event especially dear to Putin's heart. NATO has already agreed to set up new funds to help Ukraine's military effort and is set to approve the deployment of a rapid response force for ex-Soviet bloc countries unnerved by Russia's actions. The conflict has seen around 2,600 people killed and more than half a million forced from their homes since mid-April. And renewed heavy fighting was reported in Mariupol just hours before the peace talks opened. 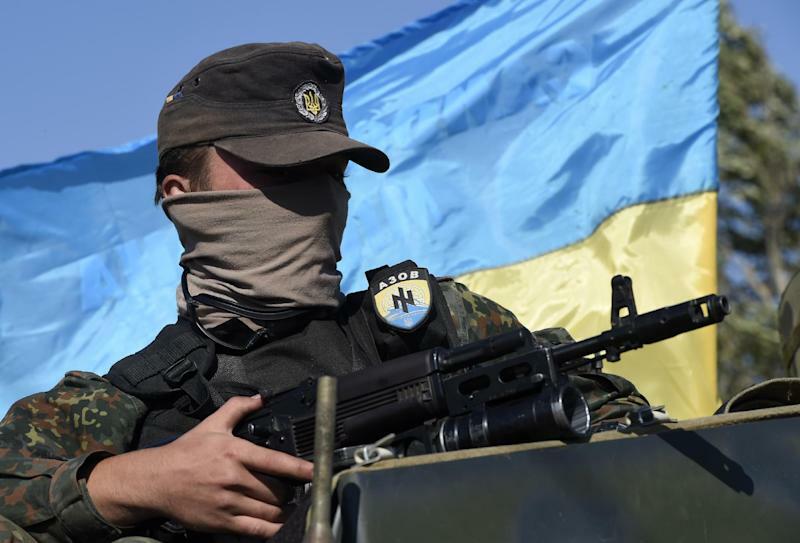 "The situation is quite tense," said a fighter with the pro-Kiev volunteer Azov Battalion who identified himself only as "Zhivchick", reporting attacks by rebels on several checkpoints. The Eurasia Group political risk consultancy said even in the event of a peace deal, "Russia is highly unlikely to cut support to the separatists, and Western governments will likely escalate sanctions in the coming weeks." Putin's push for peace would leave the rebels -- fighting what they claim is anti-Russian discrimination by Poroshenko and his more nationalist government -- in effective control of a region that accounts for one-sixth of Ukraine's population and a whopping quarter percent of its exports. A Kremlin account of the ceasefire plan said it requires both sides to halt offensive actions and for "Ukrainian armed forces units to withdraw to a distance that would make it impossible to fire on populated areas." It also establishes a "safe zone" that one rebel negotiator said should enable the militias to hold on to territories stretching to the very edges of the two separatist districts. It also calls for a prisoner swap and for observers from the OSCE European security group to monitor the porous border. Poroshenko himself has never spelled out the terms of the truce and is only sending former president Leonid Kuchma as his representative for the OSCE-brokered meeting with rebel leaders and a top Putin envoy. Signs of discontent among his allies were highlighted by Prime Minister Arseny Yatsenyuk's contention that Putin drafted the agreement to "pull the wool over the eyes of the international community" and avoid further punishment.